What are Warts & Verrucas and what causes them? Warts and verrucas are common inflictions that usually appear on the hands and feet. Their appearance can vary, but typically they resemble small lumps that develop on the skin. These lumps can appear singularly or in clusters. Certain warts are more likely to affect particular areas of the body. For example, warts that develop on the soles of the feet are called verrucas. Warts and verrucas will affect most people at some point in their life, however, they tend to be more prevalent in children and teenagers. Warts are caused by the infection Human Papilloma Virus (HPV). This virus causes the body to produce excess amounts of keratin, which is a hard protein, to develop in the epidermis. This surplus keratin accumulates to produce the hard, rough texture of a wart or verruca. Warts and verrucas can be contagious if close skin-to-skin contact occurs. Potentially, it can also be passed on through direct contact with contaminated objects, such as towels or communal changing room floors. A wart is believed to be contagious for as long as it is present on the body. The virus will more likely spread when the skin is soft or wet, or if it has been in contact with a coarse surface. It is also possible for the infection to spread to other areas of the same body. This can happen through biting, scratching or knocking a wart, or shaving your face or legs. These actions can cause the wart to break-up and bleed, which makes the infection easier to spread. It is important to note that warts can resemble certain cancers, though warts and verrucas are not cancerous. What are the symptoms of Warts & Verrucas? Common warts: These are raised round or oval shaped warts. They are firm with an irregular surface texture. These warts typically develop on the fingers, knuckles and knees. Their size can vary from less than 1mm to more than 1cm (10mm). The common wart can develop singularly or in groups. They are normally skin-coloured although they may appear rough and dry. Verrucas (plantar warts): These usually develop on the soles of the feet, leaving the affected area of skin white, often with one or more black dots in the middle. Verrucas tend to be flat rather than raised and are often painful if they are located on a weight-bearing area. Most verrucas are circular and around 2 - 4mm in diameter. Plane Warts: These are usually round, smooth and flat on top. They present with a yellowish colour and are sized between 2 - 4mm in diameter. These warts mainly affect the hands, face and legs. Plane warts are quite common in young children, developing in clusters of up to several hundred at a time. Verruca Filiformis (Filiform Warts): These warts often develop on the face and neck and are usually long and slender in appearance. Periungual Warts: This type of wart develops under and around the finger and toenails. They usually have a rough surface and their presence can be painful. Having periungual warts can also affect the shape of the affected nail. Mosaic Warts: These warts grow in clusters and usually develop on the palms of the hand and the soles of the feet. Their appearance forms a ‘tile-like’ pattern hence their name ‘mosiac’. How are Warts & Verrucas diagnosed? In most cases warts and verrucas are easy to identify as they have a distinctive appearance. Simple warts on the hands or feet that appear in small numbers can be diagnosed at home, especially if you have had previous outbreaks diagnosed by a doctor. If the wart is bleeding. If the wart’s appearance changes. If the wart is causing pain/distress/embarrassment. 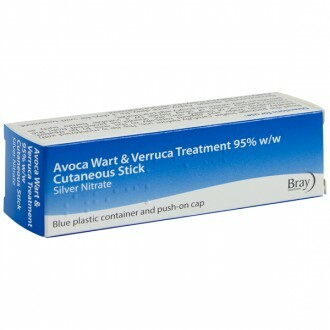 What treatments are available for Warts & Verrucas? In most cases, warts will clear up without the need for treatment. The amount of time this takes will vary from person to person. In some instances, it can take up to two years for the viral infection to leave the body. In adults and for those with a weakened immune system, warts are less likely to clear up without treatment. 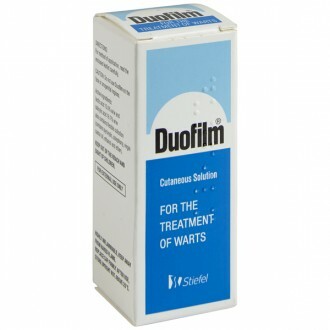 If the wart is causing pain or embarrassment then there are a range of treatments available. Salicylic acid (e.g. 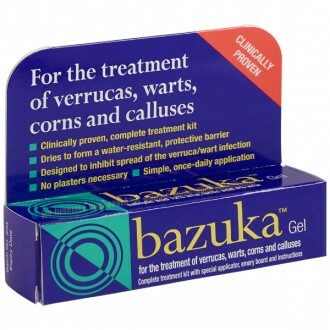 Bazuka Gel): These treatments are available in paints, plasters and gels and do not require a prescription. Before applying salicylic acid, it is recommended to use an emery board or pumice stone to gently file the wart down. It is important not to share emery boards or pumice stones with others, as this can potentially spread the infection. The filing down process should be repeated roughly once a week whilst treating a wart with salicylic acid. Before application, it is recommended to soak the wart in water for about five minutes. This will soften the wart prior to treatment. Salicylic acid should then be applied directly to the wart exactly as instructed in the information leaflet. Salicylic acid, like other wart treatments, also destroys healthy skin. This makes it important to protect the surrounding skin around the wart(s). Petroleum jelly or corn plasters can be used to cover the skin surrounding the wart. Salicylic acid may need to be applied every day for up to twelve weeks, or in some cases even longer. If the skin becomes sore or irritated then treatment should be ceased and medical advice should be sought. Salicylic acid should not be used on the face. If facial warts are present then always seek the advice of a doctor regarding appropriate treatment. Cryotherapy (e.g. Bazuka Sub-Zero): This line of treatment uses liquid nitrogen to freeze and destroy the affected skin cells. After application, which lasts only a few seconds, a sore blister will develop at the site of the wart. This will then scab over before falling off 7 - 10 days later. Larger warts will usually require repeat applications before they clear up, with a gap of a few weeks between treatments. If cryotherapy hasn’t proved successful within a three month period, continuing treatment is not likely to prove effective. Cryotherapy is often carried out at doctor’s surgeries, hospitals or skincare clinics. However, not all areas of the country offer this service on the NHS. Home cryotherapy kits, such as Bazuka Sub-Zero, can also be purchased from pharmacies. These treatments can be applied at home by following the accompanying instructions. Home cryotherapy can be a more convenient way to treat warts and verrucas as it normally only requires one to two applications. Home cryotherapy kits should not be applied to the face. Cryotherapy tends to be recommended for facial warts, as the risk of irritation is lower than when using salicylic acid. Treating facial warts should always be carried out under the care of a doctor as the risk of scarring is higher. Chemical treatments: Warts can be treated by using certain chemicals, which are available on prescription. These include chemicals such as; formaldehyde, glutaraldehyde and silver nitrate (Avoca). As with other forms of wart treatment, these chemicals are applied directly to the wart and work by killing the affected skin cells. These treatments carry the risk of staining the skin a brownish colour (glutaraldehyde) and burning the skin surrounding the wart (silver nitrate). How can I prevent Warts & Verrucas? Not touching other people’s warts. Not sharing personal items that have been in contact with a wart or verruca, such as towels or socks. Avoid picking or scratching existing warts to limit their spread to other areas of the body. Taking extra care when shaving as the virus can spread easily if a cut occurs. Keeping the feet dry and wearing a fresh pair of socks each day to help prevent warts developing on the feet. Wear flip flops or pool slippers in showers and communal changing rooms. Use a waterproof plaster or a verruca sock to cover the wart/verruca when swimming or during exercise. Wear gloves to cover any warts on the hand(s) when using shared equipment. Generally, warts will not be harmful to your health, though they may grow or spread. Warts are normally considered to be a cosmetic problem unless they cause issues similar to those listed in 'Diagnosis'. Warts are caused by an infection of certain strains of HPV, the human papilloma virus. The virus can sometimes be spread by direct contact, but warts are generally considered not to be that contagious. Indeed, some people seem to be immune to the virus, for reasons that are unclear. You are more likely to catch HPV, leading to a wart or verruca, if the area of skin is wet or damaged. HPV can also be acquired indirectly by walking barefoot on contaminated surfaces (such as a shower or the side of a swimming pool) or by using contaminated objects. After coming into contact with the virus, it may take up to a few months for the wart or verruca to be visible. How can I prevent my Wart from spreading to other parts of my body? Not touching your wart or verruca unless absolutely necessary. Immediately wash your hands if you have touched it. Avoid picking at your wart/verruca. Be careful if you need to shave the area of skin containing a wart because your razor may transmit the virus to another section of skin. Are Genital Warts different to other Warts? Genital warts tend to involve different strains of HPV than those that cause other warts. They are mainly transmitted during sexual contact. You should go to a sexual health clinic if you think that you have genital warts so that you can receive the appropriate diagnosis treatment. Once you have had your initial outbreak of genital warts diagnosed, you can treat recurrent outbreaks using our Genital Warts section. The treatment for genital warts is different than for other warts, you should not use the standard pharmacy wart treatments. What are the black dots in my Wart or Verruca? You may notice small black dots in your skin wart. These are especially common in verrucas. These are blood vessels that provide oxygen and nutrients from the blood to the wart. They are nothing to worry about and do not offer any indication of the seriousness of your wart/verruca. Should I avoid going swimming if I have a Wart or Verruca? Waterproof plasters to cover the wart. Pool slippers or flip-flops in communal areas. How long will it take for my Wart to go away? If you treat your wart or verruca, you should expect to wait at least two weeks until you see improvements. In some cases, warts can remain for up to three months. If you do not treat your wart or verruca, they will usually disappear on their own. This can take up to two years.